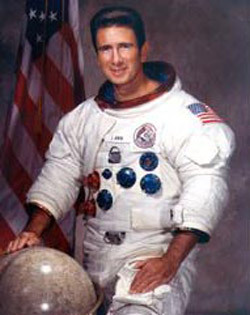 James Irwin was an American astronaut and Lunar Module pilot for Apollo 15. Irwin received a B.S. in naval science from the United States Naval Academy in 1951 and M.S. degrees in aeronautical engineering and instrumentation engineering from the University of Michigan. In the Air Force he served as a fighter pilot and test pilot. His first application to be an astronaut in 1964 failed because he was still recovering from injuries sustained in a plane crash. However, he was among 19 astronauts selected by NASA in April 1966. Although he served on the backup crews for Apollo 12 and Apollo 17, his only flight was on Apollo 15, a mission during which he drove the first lunar rover. Irwin resigned from NASA and the Air Force in July 1972, and set up an evangelical organization. His autobiography, To Rule the Night, first published in 1973 and revised in 1982, recounts his astronaut career and the spiritual revelation he experienced while on the lunar surface. Irwin became the first to die of the 12 men who walked on the Moon.